Why did the Big Dog viciously attack the big boss? But then, a genuine surprise did take place as SmackDown Live (read results here) concluded. 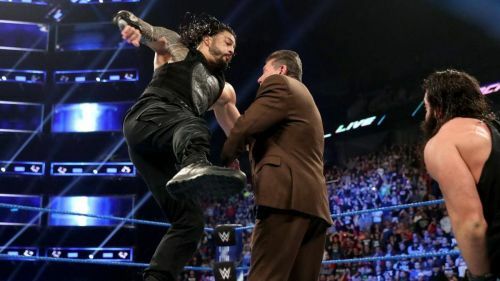 Not only did Roman Reigns come to brand blue, he assaulted the boss as well. Why did The Big Dog raise his hands on his employer? Let me try and answer the question with 5 reasons. Be sure to let me know your thoughts and views in the comments section. Here's my take on the whole situation. Roman Reigns vs. The Authority again? I'm guessing that you want to switch your television off and fling it against a wall in exasperation. Like it or not, it is a readymade storyline waiting to happen, and is a surefire way to get eyeballs on SmackDown Live before the FOX deal happens. But this is a storyline that has been attempted and executed successfully since the 90s, when Stone Cold Steve Austin took on the tyranny of Vince Mcmahon on a weekly basis and sent television ratings through the roof. It was also attempted between Becky Lynch and Stephanie McMahon more recently, and we saw the amazing payoff at WrestleMania 35. One advantage of this storyline is that it keeps Roman Reigns away from the WWE Championship picture and from Kofi Kingston, who's enjoying quite the run at the moment. So, despite your misgivings, this is not really a bad development according to me.